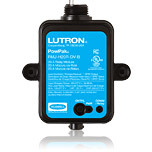 The 5 A PowPak relay module is a general purpose switch that communicates with Radio Powr Savr sensors and Pico wireless controls to create a cost-effective light control solution for single spaces, such as private offices and restrooms. Model available with a dry contact closure output. The 16 A PowPak relay module with Softswitch is a general purpose switch that communicates with Radio Powr Savr sensors and Pico wireless controls. 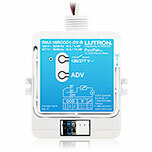 This model is available with a dry contact closure output and can be utilized to switch 15 A receptacles for control of plug loads. The 20A PowPak relay module permits the control of receptacles based on occupancy, helping you to meet building codes and standards such as ASHRAE 90.1-2010 and Title 24-2013. The module communicates wirelessly with Radio Powr Savr wireless occupancy sensors, turning off power to the receptacles when the room is unoccupied. The module can also receive inputs from Pico Wireless controls for manual switching.